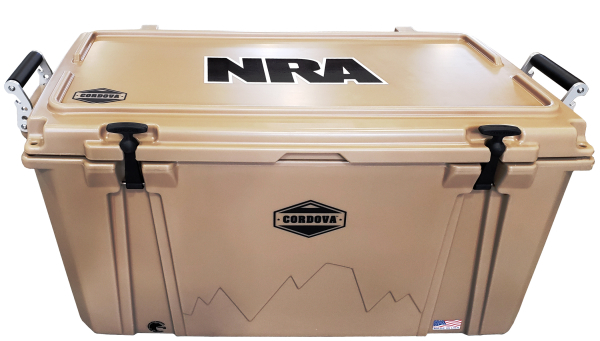 The NRA Official Licensed cooler comes all colors and proudly features the National Rifle Association acronym across the lid. Four sizes are available—small (7 gal., 20 lbs. ice, 28 cans), medium (12 gal., 40 lbs. ice, 42 cans), and large (22 gal., 70 lbs. ice, 85 cans) and XLarge (32 gallons, 120 lbs. ice, 120 cans). In the crowded field of "premium" coolers on the market today, Cordova’s hard coolers stand above the rest in terms of real-world function and performance. Cordova rotomolded coolers utilize an eco-friendly foam insulation that is more efficient and denser than conventional cooler insulation. This means the wall thickness of Cordova coolers are thinner than those of competing models, providing better cooling performance and greater interior storage capacity than other brand coolers of similar exterior dimensions. molded-in handles for a solid hand hold and to prevent "cooler sway"
To learn more about the new NRA Official Licensed coolers from Cordova or other Cordova rotomolded hard-side coolers, soft-side coolers, and accessories, visit cordovaoutdoors.com.